A stunning original oil on canvas portrait of First World War dog "Sniper". A Staffordshire Bull Terrier with a touch of dalmatian he was born in the trenches in 1916 and remained with the Scottish regiment until the end of the War undertaking his duties. He was often on patrol in khaki jacket and head painted. He was the first British dog in Germany after the war. 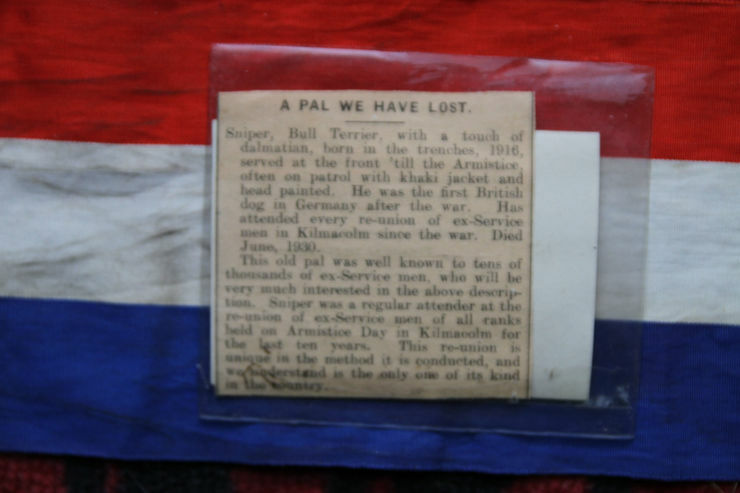 He attended every re-union of ex-servicemen in Kilmacolm since the war. He died in Hune in 1930. He was known to tens of thousands of servicemen. The portrait depicts "Sniper" in a trench. It was painted by famous Scottish dog artist Sam Fulton and is in excellent condition in a fine frame. With the painting is a photograph of Sniper after the War being cuddled by a young girl. Also with the painting is the red white and blue ribbon given to Sniper by the regiment. 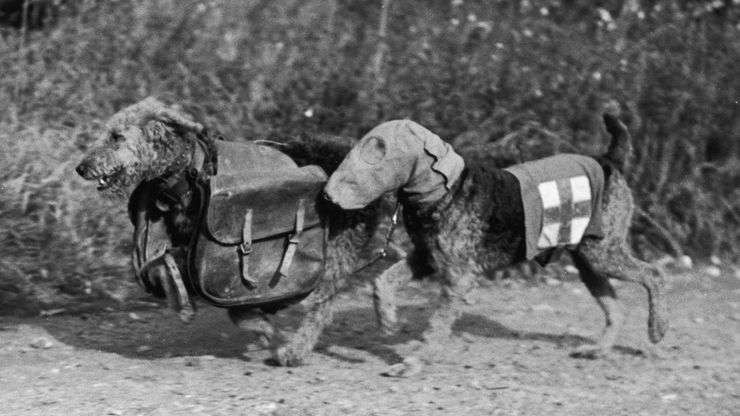 Many dogs fought in the First World War. Their duties included delivering messages and offering comfort to the soldiers. We have included a photo of WW1 dogs to show you. It's heart breaking to see these brave loyal souls and our Sniper was one of them. It is a beautiful picture and the dog has such a lovely look in his eyes. Gallery frame. 33 by 29 inches. Excellent condition. Samuel Fulton was a Scottish animal artist who concentrated chiefly on painting dogs. His brother was the landscape artist, David Fulton (1848-1930). 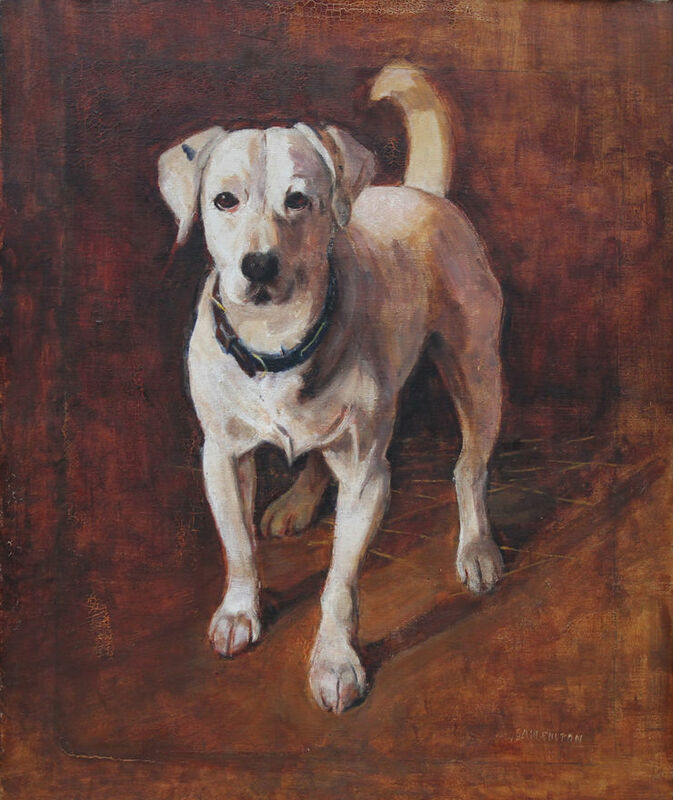 He exhibited in Glasgow and Edinburgh and he is represented in the Glasgow Art Gallery by his painting entitled "Foxhounds". His details are recorded in the book, Dictionary of Sporting Artists (1650-1990) by M.A. Wingfield.